We've lived near the Waterwitch for years so have been regular customers for birthdays, meals with friends and even Christmas once. There's plenty of choice, the food is always good but I feel the need to write a review as the past two occasions the service has been, to be honest, pretty awful. This time we were left waiting a little longer than I would class as average (but nothing to complain about) but while we were waiting a waitress came to ask "if everything's alright" which seemed faintly ridiculous while we were still waiting. Surely an "apologies for the delay, it won't be long" would have been better, no big deal but slightly odd! When the food came they had messed up the order for my meal (this happened last time with my mum's meal so it's not a one off). Although they apologised and brought the correct dish 15 minutes later (when the other 4 in my party had eaten) they asked if we could come up to the till after to correct the receipt and bill for the meal actually ordered instead. Without an itemised receipt we couldn't tell if they'd taken for the right food anyway so instead we just ordered dessert and requested the single wrong meal price be removed completely (they did do this). The dessert came before they'd cleared anything from the main meal and the staff member just tried to put down the plates prompting us to have to ask to remove the previous dishes to make room. It just all appeared as if nobody had working in food service before and were horrendously unprepared for how the basics worked! Perhaps we've been unlucky and caught them on an off day or perhaps they're employing untrained staff to operate cheaply but now this has happened twice I'm afraid they've lost a regular customer. Have previously visited the Waterwitch for lunch and everything has been excellent, however, we visited on Sunday 28th August 2011 for a Family Sunday Roast and were very disappointed. Upon placing our order we were advised they only had Gammon - no Beef, Chicken or Pork. We then had to wait the best part of an hour before our food arrived, the plate was swimming in gravy and one of the meals was minus the mash potato, the roast potatoes were extremely hard and the other vegtables seemed very crunchy. Due to the wait we did not attempt to order dessert. A very disappointing experience all round. 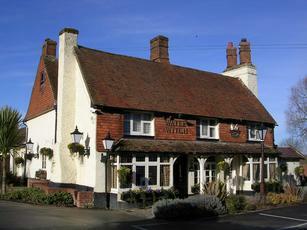 The Waterwitch is a really nice pub, for a drink! I don't recommend having a meal there. Went there for Sunday lunch on 21st of August, for a Family meal. The meal was o.k, the meat was done good, and the Mash potatoe was done nice. However the Vegatables weren't done very nice, they were rock hard. But what was disappointing, was the quality of the service. Twice I had too go up to the waitress, first to order deserts, because she was too long, after finishing the main course too ask us if we would like anything else. Then when we did get to order it took long too come, and in fact we had our coffee before our desert, and in the end I had too go up and ask where it was, because it was so long coming, I'm pretty sure they'd forgotten about us. I'm doubtful I would have another meal for sometime, but I would still go there for a drink, as it is nice too sit out in the pub garden on a summers day. Had a late afternoon lunch here. Very off-putting to find the pub deserted; no customers, no staff, all of whom were eventually found outside. Food was very good and the patio outside has pleasant views of the canal. But all let down by uncareing service. Why take us back inside to order, only to tell us we needed a table number to order, why not tell us when we were by the tables? Why not bring cutlery to the tables outside, and why, when we found the cutlery box, was it empty?